These flasks are lasered engraved on stainless steel. The perfect gift for those who enjoy a wee dram of medicinal Scotch Whiskey. 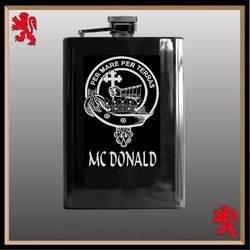 These flasks are available with any Scottish clan crest with your name spelled as you wish. These are also available with a Scottish thistle, rampant lion or Masonic design. Custom designs welcomed. Delivery is 1-3 weeks. These stainless steel flasks are lasered in a solid black. Flask size: 4-3/8" x 3-3/4" (111mm x 96mm). Flask size: 5-3/4" x 3-3/4" (141mm x 96mm). These stainless steel flasks are "powder coated" in a glossy black. The same process used in the auto industry. A very hard finish. 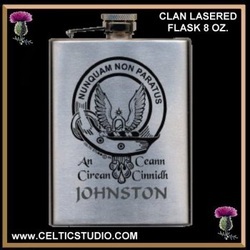 The Clan crest design is cut through the hard black finish to the stainless steel below.